The tour packages include Golden Triangle tour cities along with the Pushkar and Udaipur is one of the best packages which cover the famous destinations. Also Delhi, Jaipur, Agra will be included some of the beautiful places in India where the flow of tourists are also in large number. The beautiful mughal architecture, The Red fort, Jamma Masjid, Lotus temple, Parliament etc are famous in Delhi. 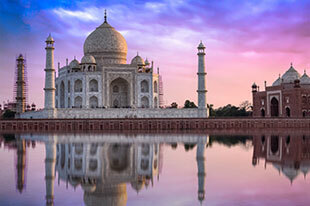 The world wonder Taj Mahal, in Agra and other famous nearby destinations are a must visit. The pink city of Jaipur has traditional monuments with many cultural activities and architectural wonders to be witnessed. 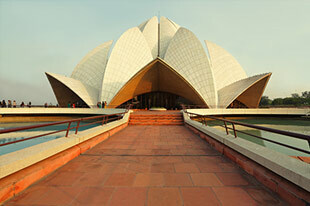 This tour package includes some of the famous cities of North India such as Delhi, Agra, Jaipur, Pushkar and Udaipur. Pushkar- The only Bharma temple in the world, pushkar lakes etc. After the morning breakfast and check out from the hotel, We will start road trip to Jaipur of 235 kms. 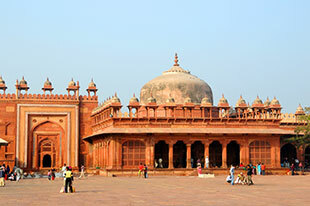 On the way, we will take you to the historical town built by Akbar, Fatehpur Sikri and the Bulund Darwaza. 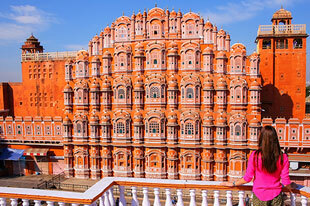 We will check in the hotel at Jaipur and start the sightseeing trip to the Hawa Mahal, Amer and Jaigrah forts. After lunch, You may spend time in shopping at the Johari and Bapu Bazaar of Jaipur. In the evening, you will enjoy the dinner in Rajasthani style and will return to the hotel in Jaipur for an overnight stay. After the breakfast from the hotel in Jaipur start the sightseeing trip to the city of Jaipur. 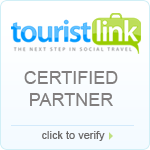 Visit the Amber Fort, Jaigarh Fort, Nahargarh Fort, City Palace, hawa mahal, Albert Hall etc. In evening you will be taken for a special Rajasthani dinner at the ethnic resort. This will be with folk music and dance. Have a overnight stay at hotel in Jaipur. After breakfast check out from the hotel and start the journey to the holy town of Pushkar. You will visit the only Brahma temple in world, Savitri temple and other sacred lakes of Pushkar. Then continue with the overnight stay at the hotel in Pushkar. After the breakfast in morning start the sightseeing travel of Pushkar and nearby places. Visit the Savitri temple and other sacred lakes of Pushkar. Do shopping at the Pushkar return to the room for dinner. Have a comfortable overnight stay at hotel in pushkar. 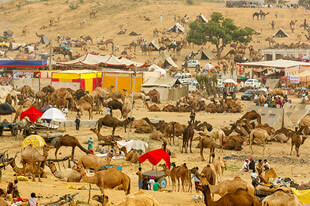 After the breakfast from the hotel in Pushkar visit some of the left out attractions in Pushkar. Then you will be transferred to the Airport / Railway station from where you can continue with your onward journey. Jaipur - Amber Fort, Hawa Mahal, Jantar Mantar, City Palace, Jaigrah forts, Johari, Bazar.